The Associate will not just "run numbers" but be an integral part of one or more of the firm's consulting teams, contributing his/her insights to client presentations, participating in client meetings, and assisting in the development of client solutions. Project work in a variety of engagements; Verify accuracy of project information and perform research; Perform due diligence; Develop customized financial models in MS Excel; Prepare client deliverable's consisting of MS Excel models and MS Word documents; Review and provide comments on agreements; Participate in development and implementation of new financing strategies, approaches and methodologies; Support deal structure and transaction negotiations with public agencies; Assist with the preparation of finance plans, feasibility/economic analysis, and other client work product; Assist with litigation support matters; Assist with company/project turnaround strategies and workouts; Ability to define a problem and coordinate relevant expertise within a team environment. Undergraduate degree required, emphasis in Economics, Finance, Civil Engineering or Accounting preferred. Graduate degree helpful, but not required. Experience with real estate engagements in a consulting or related environment is helpful. Experience with land development, entitlement, home building, civil engineering, or municipal finance is helpful. Please e-mail your resume and cover letter with salary requirement to jobs@dpfg.com. DPFG - Field Services, Inc.
Will perform construction management-type services, such as public bidding, bond exoneration, and construction management-related services by providing the best quality of professional service in meeting client needs. The manager of construction services will be involved in the planning, design, and construction of public improvements, and will steer around any obstacles and time or cost delays; Oversee Bond Exoneration by reviewing information regarding bonds, punch lists of public agencies, and site visit(s) in order to verify construction repair required; Review existing contracts and determine if clients' original subcontractors can be held accountable for agency acceptance; follow up with agencies regarding exact protocol for accepting final punch list items; Coordinate with client regarding all timing and budget issues; Provide construction management by preparing a budget, scope of work, schedule of repairs for acceptance by agency, and coordinate revision of plans; Communicate with bidders and subcontractors; Oversee public bidding by preparing and reviewing bid packages for agencies; and Administer prevailing wage bids from approved contractors. Degree in Construction Management is preferred, but not necessarily required if the person has the requisite experience and has established a solid reputation in the industry. Medical, Dental, Vision; Holiday, Vacation, and Sick Leave; Term Life, Disability Insurance, and 401(K) Plan. Prepares detailed work product for clients as directed by Disclosure Manager with emphasis on the preparation of various tax disclosure reports and documents. Ability to prepare accurate and detailed tax disclosure reports for new residential developments. Ability to perform thorough research and investigation on various taxing districts within specified area(s). Ability to analyze property tax data and prepare legal documents. Ability to perform basic to moderate math computations. Ability to communicate effectively with clients and public agencies. Ability to perform and work at a steady and productive pace in order to meet or exceed client deadlines. 1. Proficient in Excel and the ability to read, write and comprehend legal documents. 2. Continues to increase technical competency in all disclosure related areas. 1. Disclosure Associates are expected to perform their job duties in an exemplary fashion, which frequently results in additional work from clients. 2. 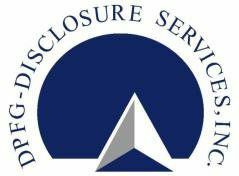 Disclosure Associates are expected to begin developing their client relations and business development skills. Disclosure Associates are encouraged to offer ideas that support the growth of the DPFG-DS Team, as well as DPFG, Inc. as a whole. Undergraduate degree or Associates degree required with an emphasis in Law (Pre-Law, Paralegal or related), Finance, Economics, or Accounting or related field. Previous work experience is preferred, but not required. 1. Excel skills assessment in order to evaluate knowledge of basic Excel functions. 2. Basic review of legal documents in order to evaluate basic proofreading skills. We offer competitive compensation and excellent Medical, Dental, Holiday, Vacation and Sick, Term Life, and Disability Insurance.